The adorable Dumbo is featured in the latest character posters, but they also provide our best look yet at Michael Keaton and Danny DeVito. Keaton, DeVito, and Tim Burton have teamed up together for the first time since 1992’s Batman Returns, which is exciting enough on its own, especially since Keaton is playing the antagonist this time around. The live-action remake of the 1941 original comes out in a few months and Disney is starting to kick the promotional campaign into high gear. 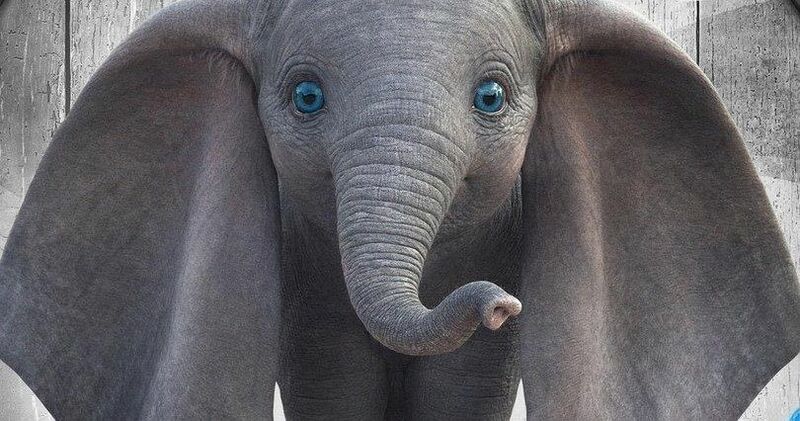 Having gotten in the new full-length Dumbo trailer in late 2018, Dumbo the elephant is the first of the character posters and the blue eyes are piercing, even taking away from the gigantic ears. Instead of looking sad, the poster actually looks a bit on the happy side of things. He was born at the struggling Medici Bros. circus, and is initially deemed a disappointment due to his huge ears. However, the tables are turned when it’s discovered that Dumbo can fly, which attracts a ton of attention, some of which is not welcome. Speaking of unwanted attention, V.A. Vandevere (Michael Keaton) is featured in another of the new Dumbo character posters. Vandevere runs the rival, state-of-the-art amusement utopia called Dreamland and he has his eyes on the special elephant, only seeing dollar signs as he attempts to exploit the special animal. Keaton admits that it was fun to play the antagonist for the live-action remake, but also talked about the positive message of the movie. When speaking about today’s culture, Keaton says, “People are worn out, not just by cruelty, but judgment and discrimination and inequality,” and Dumbo is here to take minds off of that for a little while. Danny DeVito plays Max Medici, the owner of the struggling Medici Bros. circus, but you wouldn’t know that by looking at his Dumbo character poster. He looks incredibly excited as he looks towards the camera, more than likely trying to get some paying customers to watch an elephant fly. However, that happiness might be short lived as Michael Keaton’s V.A. Vandevere comes in and manipulates Medici, along with everybody around him. Colin Farrell’s Holt Farrier character poster reveals a positive outlook, despite some trials and tribulations in his life. Farrier is a former horse showman who returns home after World War I with a missing arm. Things are not the same as when he left and he doesn’t feel comfortable at home any longer. But, things begin to turn around when he is put in charge of taking care of the baby Dumbo. As for the final character poster, it features Eva Green’s Colette Marchant, who is an aerial performer and the star of V.A. Vandevere’s show. Later in the movie, she finds herself in a unique show with the flying elephant. Dumbo hits theaters on March 29th, and you can see all of the new character posters below, thanks to Entertainment Weekly.